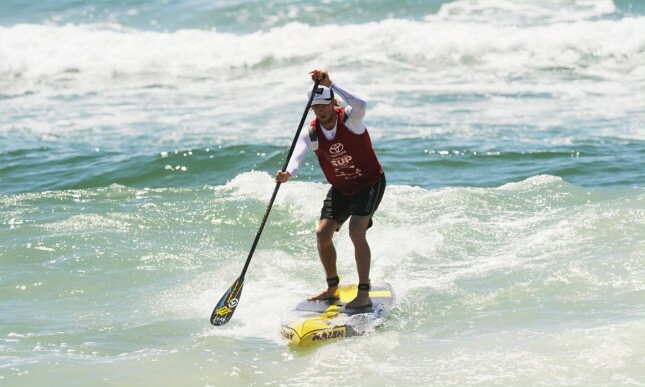 The second and final race of the 2014 Australian SUP Titles has just finished on Queensland’s Gold Coast. 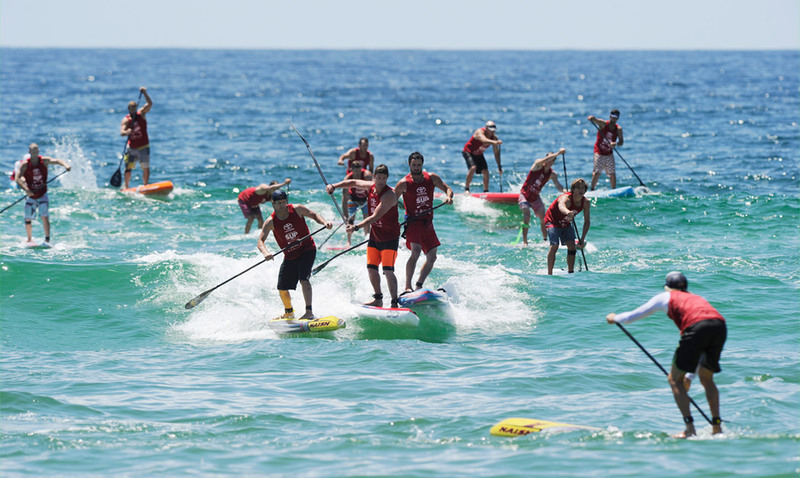 Held at the paddling mecca of Currumbin, the Aussie Titles are used to decide who represents Australia at next year’s ISA Worlds. After Toby Cracknell and Lincoln Dews went 1-2 in Thursday’s Technical Course Race, today it was Beau O’Brian taking the win in the 18km Marathon Race ahead of Jake Jensen. With light bumps mixing up the packs along the mainly-open ocean course, Beau made his move in the first half of the race and never looked back, finishing in a time of 1:37:29. It was a smashing performance by one of the strongest but most under rated guys in the world. Jake crossed second in 1:39:08, while the unheralded Michael Booth (one of the world’s leading surfski paddlers, who has recently crossed over into SUP) was just 10 seconds adrift. Beau’s win over Jake turns the tables on the battle these two guys had exactly twelve months ago, when Jake narrowly took the 2013 Australian Title in the distance race. On the women’s side it was another win for Karla Gilbert, who makes it a clean sweep after her win in the Course Race. However Karla’s win today was definitely hard fought, with 2013 Molokai champ Terrene Black pushing the defending champ all the way to the line. Karla was holding a small lead heading in from the ocean and onto the final, flat water stretch, but then Terrene grabbed a wave from the outside and close the gap to virtually nothing. A sprint over the final 1.5 kilometres to the line saw Karla hang on by just a few metres to retain her Australian Title. The 1-2 finish from Beau and Jake also presents the Surfing Australia team selectors with an interesting dilemma: Technically all four guys (Toby, Lincoln, Beau and Jake) should receive an invite. Under ISA rules, a country is allowed to enter separate athletes in the Technical Course and Marathon races. However sending four guys to the other side of the world so they can each race once seems kinda bizarre, so it’ll be interesting to see what the final squad looks like. There’s also the debate about whether or not the invitees will accept their call up for national duty. At least four of the paddlers invited to compete for Australia at the 2014 ISA Worlds declined the opportunity, so it’ll be interesting to see if the mood has changed since then. Either way it’s good to see a major sporting body taking the reins and investing into our sport. This week has not been without controversy though: There was a mix bemusement and anger at a decision to exclude the hero from Nicaragua 2014, Shakira Westdorp, from competing in Thursday’s course race. Shak was far and away the most impressive athlete at Nicaragua 2014, not just for Team Australia but the entire Championship, period. 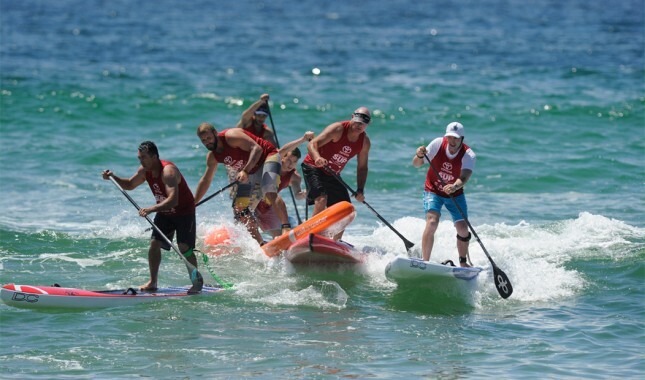 However the organisers of this week’s Aussie Titles, Surfing Australia, found a bizarre rule that said Shakira couldn’t race. The winner of four medals at this year’s Worlds was unable to compete in the recent State Titles (the qualifiers for the National Titles) and for some gobsmacking reason, the head honchos decided she wasn’t worthy of a wildcard. What’s more ridiculous is that there were just seven women on the Course Race start line on Thursday morning, yet somehow that was too crowded to allow one of the country’s most decorated stand up paddlers a spot in the race. But anyway, that drama aside, let’s not lose sight of some great performances by Karla, Toby and Beau. Here are the top finishers (click here for full results). Successful week away on the Gold Coast for the national titles. Stoked with the win in the technical and backed up by 4th in the surfing and 4th in the distance. Thanks everyone for the support this week. Much appreciated !! Karla Gilbert and Toby Cracknell have claimed the Course Race victories on Day One of the Aussie Titles, with small but tricky conditions testing the small but elite field. 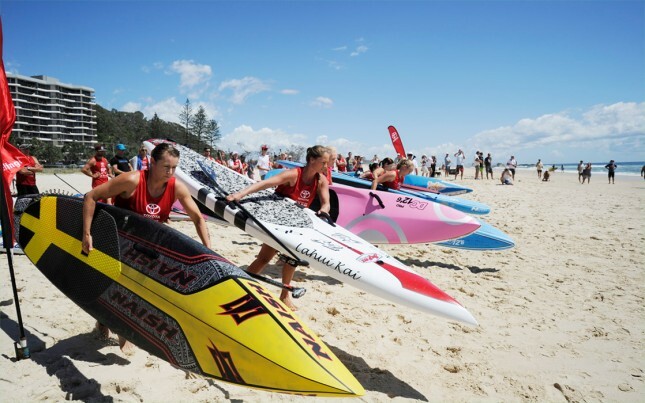 The 2014 Australian SUP Titles are happening this week at the paddling mecca of Currumbin (my old home town! ), which sits on Queensland’s Gold Coast. The top finishers will earn the right to represent Australia at the 2015 ISA World Championship, an event that’s long been rumoured to be heading to Mexico next March. Australia have won all three previous ISA Worlds: Peru 2012, Peru 2013 and Nicaragua 2014. With light winds, consistent waves and a low tide creating a tricky race at the beach break of Currumbin, it was Toby who made the best of his opportunities to oust defending champ Lincoln Dews in a sprint up the beach to the line. 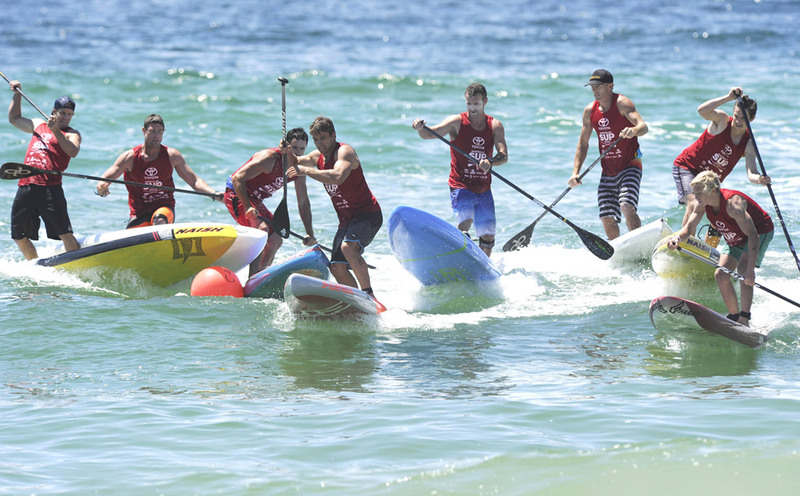 Toby’s win is even more impressive when you consider today’s third-place-finisher, Jake Jensen, was runner-up (and Lincoln 4th) at the recent Battle of the Paddle, aka the most competitive race in the world. 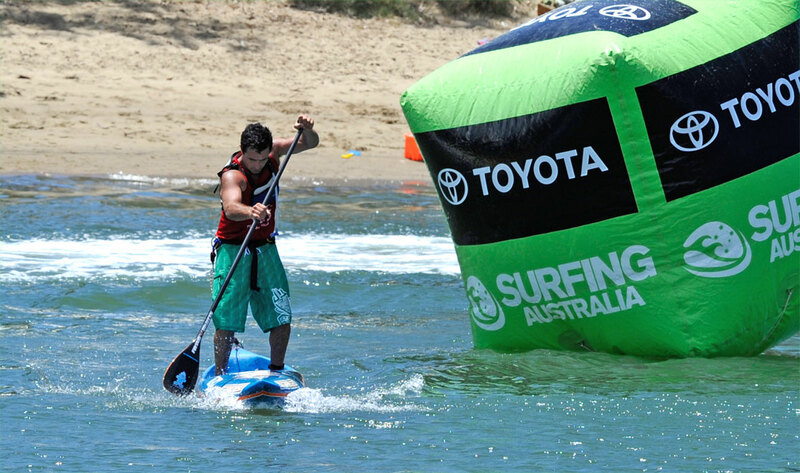 It’s also quite fitting that Toby and Lincoln went 1-2 today, seeing it was they who represented Australia at the 2014 ISA World Stand Up Paddle and Paddleboard Championship in Nicaragua. At that event it was Lincoln who stood up, bringing home 2x silver medals as the nation swept its way to a three-peat in the team championship. 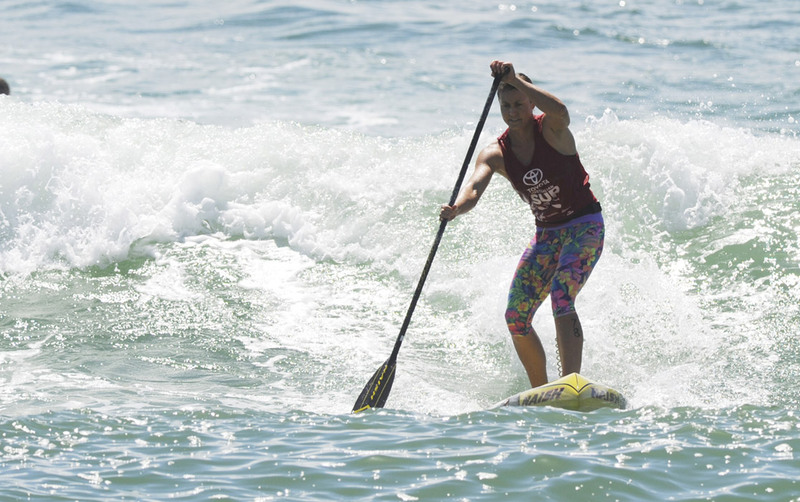 While the women’s event didn’t exactly draw record numbers today, Karla’s win – ahead of 2013 Molokai-2-Oahu champ Terrene Black – was rather dominant and showed that, if she accepts her invitation, Australia will surely start favourites for a fourth straight ISA crown next year. Karla is no stranger to the surf, having won seven straight surf live saving crowns in her former career as the Queen of Australian lifeguard racing. And finally, in a further sign of just how frighteningly deep Australia’s talent pool runs, the current world #11 Beau O’Brian finished 6th and perennial BOP podium getter Kelly Margetts was 9th, while Travis Grant (currently ranked #5 in the world) and 2x ISA gold medalist Jamie Mitchell weren’t even in the country.